“Hermia & Helena” is primarily the story of Camila (Agustina Muñoz), a young woman from Buenos Aires who takes up an artistic residency in New York City to do a translation of Shakespeare’s A Midsummer Night’s Dream, while wading through some drama of her own. Her tale is told in a manner not too differently from “Master of None,” agreeing with the Aziz Ansari Netflix show that characters and their experiences can thrive episodically. But as a type of mini mini-series about the low-key dramatic world of Camila, Matias Piñeiro’s “Hermia & Helena”’s touch-and-go approach weakens the movie’s key expression of being a relatable story about being lost during your late 20s/early 30s. Played by frequent Piñeiro collaborator Muñoz, is quickly an intriguing character, but Piñeiro’s script feels slight when magnifying what makes her interesting. She’s clearly going through a lot, as a translator wrestling a timeless text, a daughter to a father that she doesn’t know, a friend to people whose lives are more collected back in Buenos Aires, and as a girlfriend to a young man back home who has no idea about the New Yorker (Keith Poulson) with whom she spends intimate time. But these attributes, as explored through undercooked, episodic pieces that take us back and forth in time and from Buenos Aires to New York and back again, rarely inspire curiosity, in spite of the focused performance from Muñoz. Even the Shakespearean context that she’s placed in, the text literally projected over her face in some instances, becomes another attribute that feels prepared to be either taken or left by the viewer. This is Piñeiro’s fourth movie, which is surprising as the movie smacks of a greener talent who has plenty of ideas but no way to make them seamless. Instead, while the film isn’t visually bland in the slightest for a story that heavily relies on location and dialogue, it shoves together different things: economical fillmmaking that often zeroes in on hands, spinning 360 wide shots that observe one person through a large NYC park. There’s even a brief moment where we’re subjected to the student film made by Camila’s long-lost fling, a five-minute cut-up of Daphne Du Maurier’s “Rebecca.” And when “Hermia & Helena” wants to be delicate, as with overlapping images of a NY bridge with that of Argentinian nature, used as a slow visual transition, it comes across as obvious even if pretty to look at. A type of silver lining, Piñeiro proves to be an unpredictable filmmaker. As both a survey of Camila’s relationships and a creaky indie enterprise, “Hermia & Helena” does loosen everything up with its consistent use of Scott Joplin ragtime tunes. But the whole thing is perhaps too reserved, like with a scene in which she interviews her father, which is anticipated like a delicate climax. Instead, it’s an assortment of acting beats, with very real emotion registering as a third or fourth filmmaking priority. 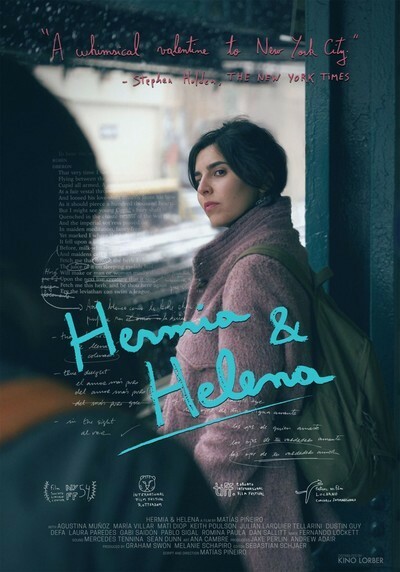 “Hermia & Helena” presents a unique anomaly—it’s able to capture life at its most low-key but still manages to exemplify style over substance.